Turns out the Orioles weren’t joking, as they signed Bell to a minor league contract two days later. It’s not like the Baltimore bullpen doesn’t need help. They are currently have the 5th worst FIP in all of baseball (or 26th best if you’re an optimist), and have barely been better than replacement level as a group (0.3 fWAR). Additionally, the bullpen only strikes out 18.0% of batters faced, which places them 28th in baseball (not good). Ryan Webb, Darren O’Day, and Zach Britton are the only relievers who can be trusted at this point, so taking a flier on Bell isn’t the worst idea. Although this isn’t the Heath Bell of 2007-2010 fame, so even if he makes it back to the major league roster, the Orioles won’t be getting the shutdown closer that anchored those great San Diego bullpens all those years ago. In fact, Bell was only a free agent because he pitched so poorly that Tampa Bay cut bait on him last week, even though they were on the hook for $5.5 million of his 2014 salary. Take a second to let that sink in, while I remind you that the Rays are the complete opposite of big spenders (little spenders? ), and had a team payroll in 2011 that was less than what the Yankees were paying the left side of their starting infield. Additionally, the Rays are typically a very well-run team, so the fact that they are paying Bell approximately $4.3 million the rest of the season to NOT pitch for them doesn’t inspire much confidence. Looking solely at ERA, 2012-2014 really stick out, making it look like Bell hasn’t been a productive pitcher for some time now. Now there are some “bad luck” indicators involved in each of these seasons, such as high BABIP’s (all 3 years), low LOB% (2012 and 2014), and a sky high HR/FB% (2013). However, there are other aspects of those years that make you think twice about chalking it up solely to bad luck. First there is the decreasing strikeout rates and increasing walk rates in 2012 and 2014. Then you have the increased LD% in 2012 and 2013 (both years approximately 3% higher than career average). Finally, Fangraphs shows that he’s also lost about 2 mph off of both his fastball and sinker so far this season. If we dig a little bit deeper and look only at his fastball and sinker, which he has thrown roughly 60-70% of the time over the course of his career, you see several outcomes trending in the wrong direction (click the picture to increase size). There is nothing really from the above table from which you could draw something positive. If you reach, you could say that he’s throwing less 4-seam fastballs and more sinkers, and he hasn’t given up a home run on a sinker since 2011. Like I said, it’s a reach. So Bell has become more hittable since his days in sunny San Diego, but anyone could see that just by watching him pitch the last 3 years. It was easy to see one reason why he’s become more hittable while I was surfing the wonderful Pitch F/X website that is Brooks Baseball, when I came across a section that showed percentage of pitches “grooved”. 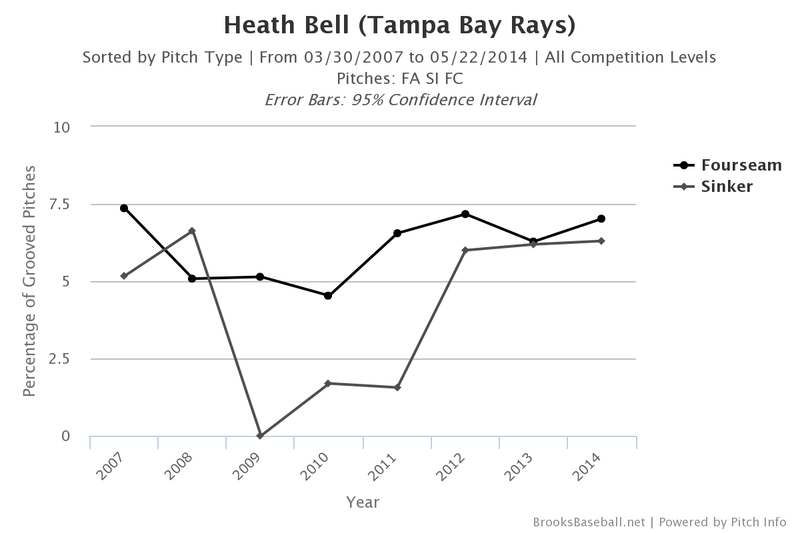 As the figure below shows, Bell appears to have been “grooving” a lot of fastballs and sinkers since the start of 2012. In fact, he probably got away with some of those pitches in 2011, as he finished the year with a well below BABIP of .261. Just as a point of reference, Tommy Hunter has “grooved” his fastball at a similar rate as Heath Bell since 2012, and his stuff (including a fastball that is currently about 6-7 mph faster) is much better. The cost of the Orioles signing Heath Bell to a minor league contract was virtually zero, with the roster spot potentially worth more than the money the team will be paying him. It’s definitely a low risk move in that the team can easily cut Bell loose if it doesn’t work out. However, unlike many other low risk moves, based on the information provided above, the low risk doesn’t look like it will come with the potential of a high reward, or possibly any reward for that matter. This entry was posted on May 23, 2014 at 10:00 am and is filed under Free Agency, Playoffs with tags Darren O'Day, Heath Bell, Ryan Webb, Tommy Hunter, Zach Britton. You can follow any responses to this entry through the RSS 2.0 feed. You can leave a response, or trackback from your own site.